Peter Rodger, the IAM's Chief Examiner, gives common sense advice to to be aware of cyclists and motorcyclists sharing the road with them. Keep an eye out for cyclists and motorcyclists and give them extra space. Use your mirrors so you see bikes approaching from behind. In particular check your mirrors before changing direction, especially in traffic queues. 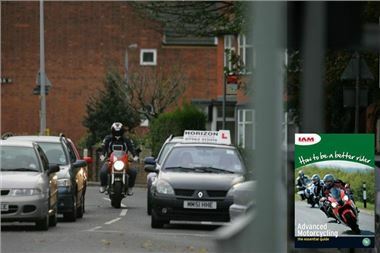 If a motorcyclist is trying to get past in heavy traffic, let them. Don’t try and hinder their progress because you are stuck. Give clear and early signals to allow other road users time to react. Don’t cut up a cyclist when turning left. Never overtake then turn left across their front wheel. Overtake gently. Passing a cyclist quickly might feel safe to you, but it doesn’t to the cyclist and the closer you are the more this is the case. Leave cyclists enough room when you pass them to allow them to move out to negotiate drains and potholes. Check for bikes before opening the driver’s door when you’ve parked.